Taken from Rowan Brushed Fleece pattern book. 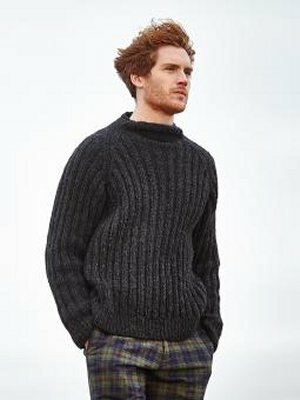 Men's pullover ribbed sweater with sewn-in raglan sleeves and funnel (crew) neck, for the beginner knitter. This pattern is from Rowan Brushed Fleece, pg 66 - Trent. Size US 8 and 10 straight needles (or size needed to obtain gauge) are required but not included. Finished Chest Measurements: 38 (40, 42, 44, 46, 48, 50)" after blocking. Gauge: 16 sts and 19 rows over 4". Color Shown is Peat 262. $121.50 -- Kit price including yarn only (no book or pattern). $139.45 -- Kit price including yarn and pattern book. $135.00 -- Kit price including yarn only (no book or pattern). $152.95 -- Kit price including yarn and pattern book. $148.50 -- Kit price including yarn only (no book or pattern). $166.45 -- Kit price including yarn and pattern book. $162.00 -- Kit price including yarn only (no book or pattern). $179.95 -- Kit price including yarn and pattern book. $189.00 -- Kit price including yarn only (no book or pattern). $206.95 -- Kit price including yarn and pattern book.